Co-hosts the TV show Big Shot along with Punch. 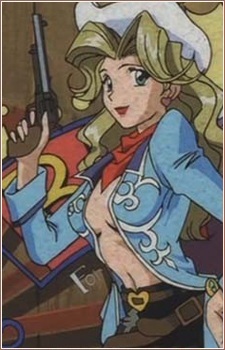 The show features the duo in western attire and provides information on popular Bounty Heads throughout the star system. Judy acts like a stereotypical dumb-blonde, and wears a very revealing outfit. After Punch announces that the show has been cancelled, Judy reacts violently and exclaims that "The station will hear from her agent about this!" Later, it is revealed that she is engaged to be married to her agent.